Rome at Easter - 7 Day Rome Pilgrimage. Experience Easter in Rome. Rome Easter Pilgrimage for Catholics visiting Rome for Holy Week and Easter. 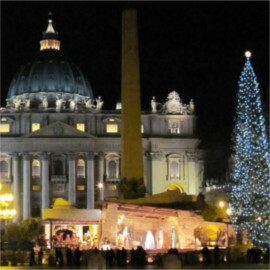 What Are The Features of This "Easter in Rome Pilgrimage" Package? Easter is the holiest time of the year. The culmination of Lenten preparation to commemorate the greatest event in human history - the salvific passion, death and resurrection of the God-Man - Jesus Christ. 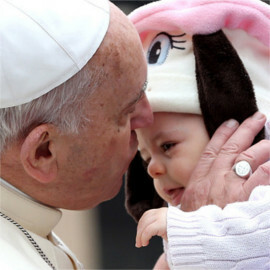 What better time to visit Rome on pilgrimage than Holy Week and Easter? 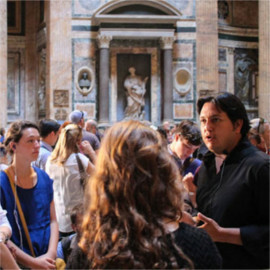 Eternal City Tours are therefore keen to offer this "Easter in Rome" 7 Day Pilgrimage package to assist pilgrims in engaging more deeply with the spirit and activities of Lent & Easter. This pilgrimage is available for individual or small groups to join, in addition to also being available for larger groups who want the pilgrimage to be exclusive to their booking. We have sufficient resources to handle both types of customer. 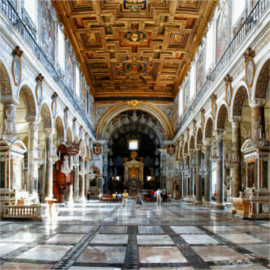 Expert guided tours of each of the 4 Papal Basilicas of Rome - St John Lateran, St Mary Major, St Pauls and St Peters - Pilgrims will be taken to the ancient 4 Major Papal Basilicas of Rome with entrance and detailed interesting guided tours of each basilica. Fascinating Day Trip to Orvieto - An all inclusive paid day trip to the medieval city of Orvieto containing relics of perhaps the greatest Eucharistic miracle that prompted the inauguration of the feast of Corpus Christi. Truly follow in the footsteps of the saints! 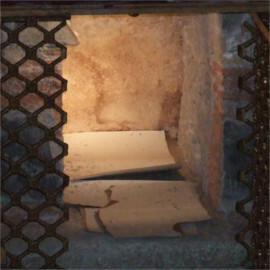 - following in the footsteps of Sts Peter & Paul, the patrons of Rome, visit where they are both buried, visit the chains that once bound St Peter, visit the prison where both St Peter & Paul were held captive and visit the house where St Paul was placed under house arrest and where he wrote many of his epistles. 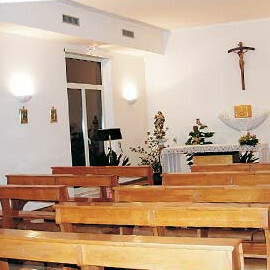 Daily Mass & Confession - A priest and chapel can be provided by Eternal City Tours if your group is not travelling with a priest. We also pay the priests' stipend on your behalf. 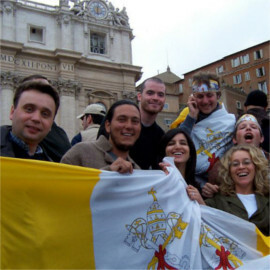 Transport included - Transport to the basilicas, and places of interest are included in the pilgrimage package, as are all taxes and ticket costs. When you arrive in Rome you will be met by your Eternal City Tours Pilgrimage Director who will check you into your accommodation if you have booked this with us. 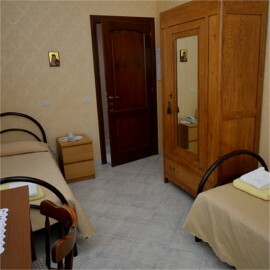 You will be given time to settle in and will be distributed Pilgrimage Itineraries and ECT Rome Maps complete with meeting points, tips and recommendations for Cafés Restaurants and Shopping. 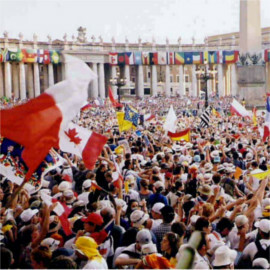 Pilgrimage group leaders will be loaned ECT Mobile phones for the duration of the pilgrimage in Rome to aid communication at all times. There will then be evening Mass at the Basilica of Saint Paul Outside the Walls, Reflections and Restaurant Dinner (for those who opted for meals). After morning mass at the church of Santissima Trinita Dei Monti (the Mother Church of the Society of the Sacred Heart) above the Spanish steps (or at your accommodation depending on logistics), we take a stroll through the history and art of Rome. You will read the visual history of battle and victory portrayed on the ancient column of Trajan, and even see the place where the great Mihelangelo once lived. You’ll see where Mussolini declared war on the Allied Nations and where the most famous of history's dictators, Julius Caesar, fell at the hands of Brutus and the Liberators. You will experience the most glorious feat of architecture in all the world - the Pantheon - and stroll through an ancient stadium transformed into a baroque square in Piazza Navona. Finishing off you’ll be brought to Campo De' Fiori which was once a market for flowers and square for public execution but is today the center of Roman night life and some of the finest Italian cuisine in Rome, where you can eat, drink and bask in the atmosphere. Your group will be Free all afternoon so feel free to revisit your favorite places, shop for gifts or do some of our additional Tours. Rise and shine! - We leave Rome early in the morning on a 2 hour bus ride through the breathtaking Umbrian countryside stopping for a nice Italian breakfast break along the way. Once in Orvieto, we take the Funicular (a tilted elevator) to the top of a 1000 ft volcanic hill fortress city and take a short walk to attend the mass followed by the procession of the Corporal of Bolsena. This relic from the 13th century is a corporal cloth involved in the Eucharistic Miracle of Bolsena when, at the consecration, the bread and wine turned into the Body & Blood of Christ not only in substance but also in appearance. 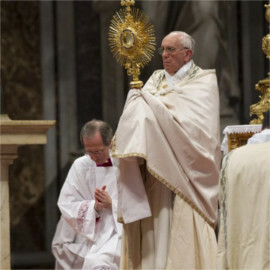 Blood dripped from the Blessed Sacrament onto the corporal before the eyes of a doubting priest and this miracle proved the catalyst for the instigation of the liturgical Solemnity of Corpus Christi. After the procession we will tour the beautiful Signorelli chapel which is a priceless testament to the birth of the Italian renaissance. 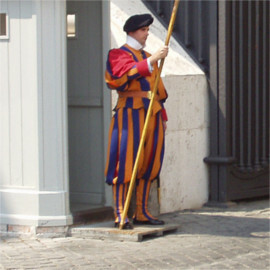 We will then continue on a walking tour of the city where the Pope reigned as sovereign. After reflection and prayer we will then visit the city’s local out-door farmers market in Piazza del Popolo where you can experience the rich diversity of Italian produce, cheeses and the jewel of the region “White Wine” including “EST! EST!! EST!! !,” the wine made famous by a Bishop / Wine Aficionado who sent out his servant to identify the best wine shops in the area by writing EST Latin for “it is” on their doors. 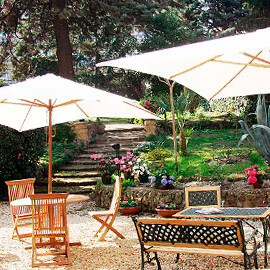 There after you are free for 2 hours to site down for a nice lunch in one of Orvieto’s local trattoria, visit some the artisan shops, tour the ancient Etruscan tunnels that wined through the heart of the volcanic hill or have a delicious picnic and a glass of wine in Albornoz fortress overlooking the captivating landscapes of Umbria. Back on the bus to Rome. Group will be Free all morning but it’s recommended to save your energy since we will be up late. When the Roman Empire embraced the faith it once persecuted, it exploded into a frenzy of observance for the history and truth of the Christian faith manifest in the literary, the artistic and the relics of the early Christian church. Many of these were then brought to caput mundi - Rome. 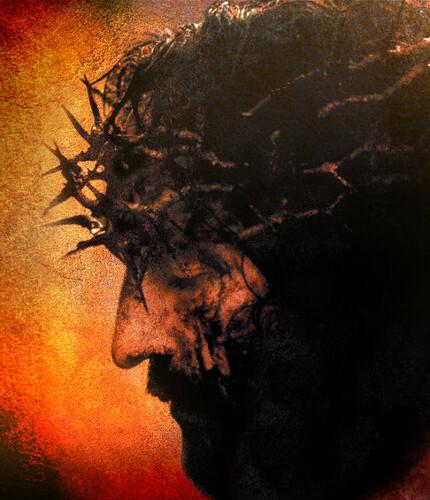 You will be granted a once in a lifetime opportunity to see first hand the relics and objects of Christ's passion. We begin with noon Mass at the Basilica of Santa Maria Maggiore, one of the oldest Churches dedicated to Theotokos (Mother of God) in Rome containing, beneath its center altar, wood from the manger in which our Lord Jesus Christ was lay at birth. This papal basilica has been adorned by every époque of Italian art history, and even holds the body of the devout baroque artist Gian Lorenzo Bernini. 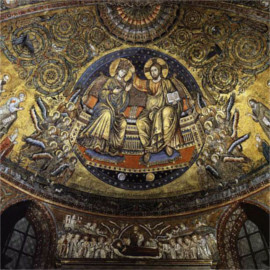 We then walk over to the Basilica of San Prassede which was built in the 8th century and holds some of the finest examples of medieval Christian art. This basilica also contains a fragment of the pillar upon which Christ was scourged for veneration by the faithful. Only a few yards away we then enter the church of San Alfonso Ligouri to see the beautiful 15th century Byzantine icon “Our Lady of Perpetual Help / Succour” also known as the Virgin of the Passion or Theotokos of the Passion. After we visit the Church of the Holy Stairs brought from Jerusalem and so named because they are the steps which led to the praetorium of the then Roman procurator - Pontius Pilate. Since our Lord Jesus descended those very steps in condemnation, then the tradition is that all pilgrims who are able, ascend them on their knees. From there we visit the Cathedral of Rome, the Basilica of Saint John Lateran and finally enter a Church built by the mother of Constantine - St Helena. The church built over spread earth taken from Golgotha brought with relics from Jerusalem was her personal chapel holding to this day relics of the Passion of Christ including those of the Holy Sepulcher, the Cave of Bethlehem, a Nail of The Crucifixion, a Thorn of The Crown and a small walnut board reading Jesus the Nazarene king of the Jews. 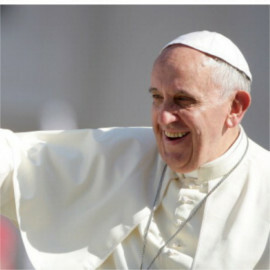 This will be followed by attendance of the Stations of the Cross with Pope Francis at the Coliseum OR as an add-on option: Take a 1hr ride to the beautiful lake Town of Bracciano where after an early dinner (No Meat) we will have free time for personal prayer in preparation to see “La Passione di Cristo” a powerful and emotional Passion Play performed in the medieval streets of this Italian village near Rome for more than 40 years. 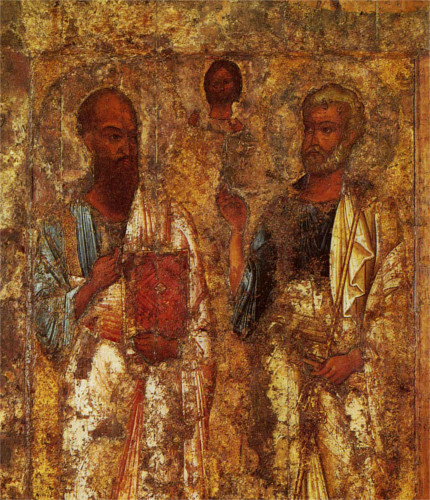 Peter and Paul are two of the most influential followers of the Lord and Savior Jesus Christ. They both would suffer their death in what was then the Capital of the World, Rome. On our 3 hour tour we will visit some of the places where they planted the seeds of evangelization. The day begins with Mass at the church of Saint Peter in Chains containing chains that once bound St Peter, brought to Rome by the Christian Empress Eudoxia. Beyond seeing the Chains which once bound Peter in prison in Jerusalem before his miraculous liberation the church also bears the masterful statue of Moses by Michelangelo. Then hold your breath as we descend beneath a church into the ancient roman Mamertine prison which held most notaries enemies of the roman state, Peter and Paul. Experience the moments before the certain death of two men who went from denying and persecuting Christ to dying for Him. Finally we finish at the church built over the site where Paul was put under house arrest. Learn why Paul was brought to Rome to sit trial before Caesar and why the Apostle of the Gentiles held the privilege of being a Roman Citizen. Group will be Free all afternoon so feel free to revisit your favorite places, shop for gifts or do some of our additional Tours. 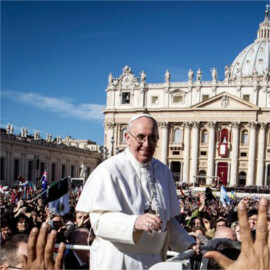 The day starts with Easter morning Mass with Pope Francis in Saint Peters Square there you will experience a concert of Latin Chant echoed across beautiful stone columns outstretched from Saint Peter’s Basilica like the arms of mother church embracing her faithful. There the readings from scripture will be given in multiple languages followed by a brief homily so expect Mass to last around 2 hours. Shortly after the Divine Liturgy, Pope Francis will deliver the Urbi et Orbi blessing. 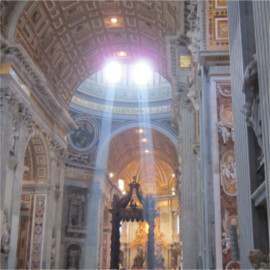 The Urbi et Orbi is an apostolic blessing of the City of Rome and the World in practice since the 13th century. Finally we will break the Lenten Fast with a handsome Easter Lunch worthy of this Central Feast of the Catholic Faith. 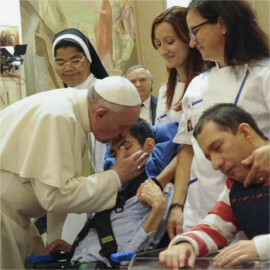 Some evenings the group will have the opportunity to aid Rome’s Religious Communities in performing various corporal works of mercy. The pilgrimage will only go ahead when 12 or more people have booked on it. All possible add-ons available with group discounts include: Vatican Tour, Crypts & Catacombs Tour, Peter & Paul Tour, Coliseum & Ancient Rome Tour, Italian Food and Wine Tour, Trastevere and Jewish Ghetto Tour, Italian Wine Tour, Borghese Gallery Tour, Caravaggio Tour, or VIP Painting & Cooking Lessons. The base price is the price for all of the pilgrimage activities and includes all guide fees, tickets, skip the line vouchers (where applicable), taxes and activity private transport. If you book a pilgrimage with us, we don’t force you to also get your food from us. That said, why wouldn’t you choose to let us provide your delicious Italian meals for you? For pilgrims who want to add this to their pilgrimage package, we offer lunch and dinner each day (with breakfast included as part of the accommodation option). 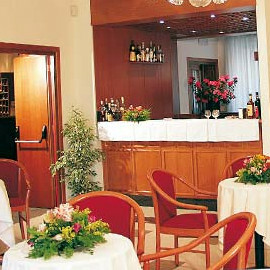 Our meals will be served at traditional Roman restaurants that we have hand picked for their delicious food, great atmosphere and value for money. By choosing this option we can ensure you get quality Italian cuisine at a reasonable price and that you won’t be ripped off by unscrupulous restauranteurs or food vendors charging tourists extortionate prices. For those pilgrims who suffer from special food allergies or intolerances, we can ensure that your special needs are catered for in respect of ingredients and careful preparation. If you suffer from such a condition, please ensure that you communicate this to us in full when you make your booking and then we can give you a report on what we will do for you in order to set your mind at ease. 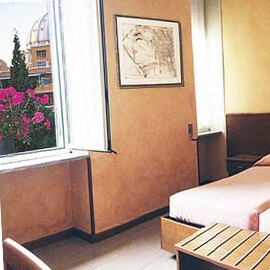 Don’t let your special circumstances spoil your experience of the Eternal City - we will look after you. 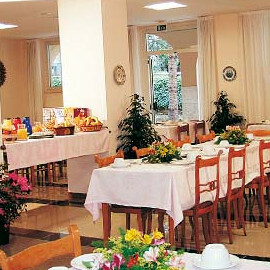 Breakfast is an Italian continental type breakfast of cereals, pastries, coffee and juice. We offer our pilgrims the freedom to choose whether they wish to stay in our excellent accommodation or not, although the vast majority of our groups take advantage of this opportunity. Pilgrims who choose our accommodation option will enjoy either 4 star or 3 star hotel level accommodation that is both clean & comfortable with excellent facilities (subject to availability). 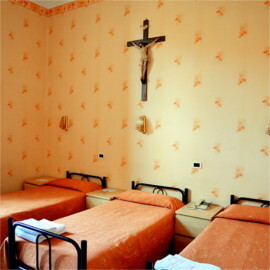 There are numerous accommodations that we use, depending of course on the pilgrimage group size and the time of year. 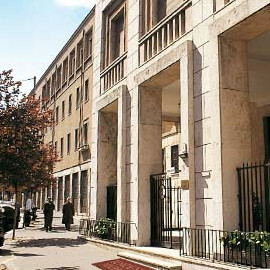 Pilgrims will therefore stay at either the prestigious Irish College - a historic and elegant palazzo with clean, spacious, comfortable rooms and great facilities, or, at our 3 star hotel accommodation in the heart of Rome - a short wallk from the main tourist attractions. 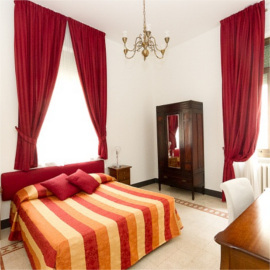 All accommodations however enjoy rooms which are simply but elegantly decorated with classic furnishings and rich fabrics. Each of the rooms also boast the latest modern conveniences including free Wi-Fi internet access, air conditioning, desk, telephone, wardrobe, and private bathrooms. 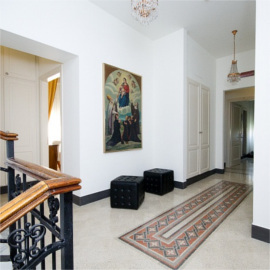 All of our accommodations are also centrally located within easy walking distance of the major tourist attractions which enables our pilgrims to enjoy their free time. In addition to our comfortable room facilities, our accommodation further offers a large breakfast room serving a continental Italian breakfast each morning, an amply sized chapel, relaxing gardens, a swimming pool and a patio area for enjoying the Italian sunshine, perhaps whilst drinking a cool glass of white wine or other refreshment. 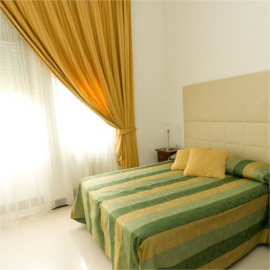 For those who prefer the details of practicality, our accommodation also offers a laundry service, ironing facilities, provides all bedding, towels, hairdryers and even offers a currency exchange service. To further add to your comfort, all of our rooms are provided on a single occupancy basis unless you prefer double occupancy. What is Not Included in this Rome Easter Pilgrimage? Forgiveness of Sin and Entrance to Heaven! 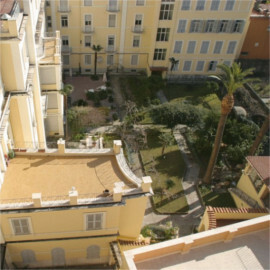 If you choose the option of Accommodation, then this is subject to availability. Obviously, the earlier you book, the more chance that accommodation will be available. If however, accommodation is not available, the price relating to this option will be completely refunded to you. Meals UNLESS you choose this option during the booking process. 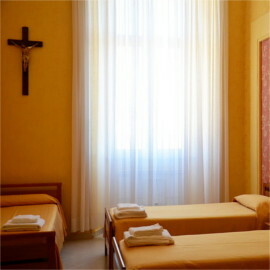 Pilgrims can also book accommodation for their group as an optional add-on. Pilgrims are also able to include meals with their pilgrimage in order to commune as a group.